Codemasters manage the near-impossible - delivering a fresh, approachable, and (largely) credible F1 game. The dominant scent in the Lotus garage at the moment isn't warm Bridgestones or posh deodorant – it's defeat. Nine races into the 2010 season and the team have yet to score a point. By rights, their new driver, a Finn called Timo Stone, should be ready to throw in the towel. The fact that he isn't says a lot about Codemasters refreshingly risqué take on F1. A lazier licence-holder would simply have bolted some next-gen visuals onto a stock genre template, then swanned off to the bank. Codies, to their credit, have tried something far bolder. 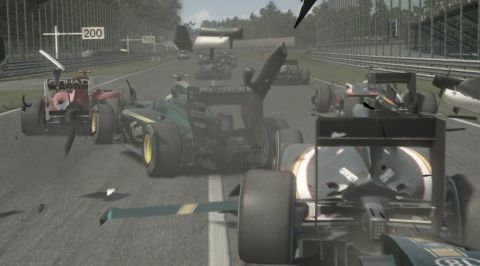 F1 2010's career mode provides a fascinating glimpse of what it must be like to be a Lucas di Grassi or a Bruno Senna, a driver at the bottom of the pecking order, cursed with a car that is woefully uncompetitive. For your first season (careers can span up to seven 19-race seasons) podium finishes are a preposterous pipedream. You are just battling to out-perform your teammate and to meet very modest team objectives. A twelfth place finish or qualifying on the seventh row can be enough to see your stock rise. Keep turning in solid performances and dealing with press questions, and eventually the offers from bigger teams should roll in. Well, that's the theory. Right now even meeting the demands of a minnow outfit is tricky. Whether this is down to difficulty levels, or inherent (realistic) car weaknesses, it's hard to say, but demanding physics can't be implicated. The handling models are an entertaining yet faintly patronising mix of the rigorous and the reined-in. Turn off all the driver aids and the steeds still feel a tad sedated. If you're used to wrestling spirited SimBin and ISI open-wheelers, you may find yourself surprised at how surefooted the cars feel in corners, and how tolerant they are of violent wheel and throttle inputs. The top sims – rFactor, GTR Evo, iRacing – all provide more visual and aural motion cues, meaning driving on the ragged edge is a more intuitive and satisfying business than it is here. F1's rides are at their most mischievous when the heavens open mid-race and you're caught improperly attyred. Dynamic weather can turn a grippy ribbon of tarmac into a perilous puddle-strewn skidpan in a matter of minutes. The camera and spray effects that accompany these downpours are superb. Hurtling through Monte Carlo's winding streets or Spa's forested vales with visor bejewelled, and world refracted and reflected, is an unforgettable experience. AI drivers hold up their end of the illusion well too. They'll jealously guard racing lines, dart through gaps and clash and run wide on occasions. Whether you've opted for the truncated versions of Grand Prix (usually around 10 laps) or the full marathons, you'll invariably cross the line exhilarated, exhausted, and haunted by what-ifs. What if I'd chosen a faster but less stable setup? What if I'd pitted earlier? What if I hadn't rear-ended Barrichello at La Rascasse and earned that brutal ten second stop-go penalty? Even with flag realism reduced, the marshals are a merciless lot. Much work has obviously gone into capturing the sport's technical and regulatory side. Recent rule changes all loom large in the race strategies that you either devise yourself or leave up to your team. F1 2010 almost spins out on the final corner thanks to some low framerates on denser tracks, and excruciatingly poor savegame and replay facilities, but its core of solid racing thrills sees it through. If you like your speed duels redolent, gorgeous and glazed with glamour/ rain, this is a risk-free purchase.